SSE pulls the trigger on a new UK CCGT project despite a big gap between current market price signals & required returns. The 8 £/kW clearing price in this year’s capacity auction presented a serious roadblock for new CCGT projects. But Scottish utility SSE has mounted the sidewalk and driven around it. SSE announced it is about to commence construction of its Keadby 2 North Lincolnshire CCGT project. SSE will invest £350m in the 840MW plant with a headline efficiency of 57% (HHV). It is developing the project in partnership with Siemens. Scottish Power’s Damhead Creek 2 project looked to have a significant ‘first mover’ advantage over other new build CCGT options given a favourable location near London. In today’s article we explore some of the potential drivers behind SSE’s decision. The market risk associated with the development of Keadby 2 sits firmly on the shoulders of project equity investors. Without a 15 year capacity agreement the project will struggle to gain any significant advantage through debt financing. SSE’s is likely to require a significant recovery in wholesale and capacity prices versus current market conditions in order to make a return on capital invested. Chart 1 illustrates the margin gap between current market price signals and what we estimate is required to pay back capex on a 57% efficient CCGT. Calculation of ‘required margin’ in the chart is based on annual margin required to cover an 8% post tax nominal return on a latest generation CCGT plant in this location (estimated at 90 £/kW). Chart 1 illustrates what we estimate to be a gap of at least 25-30 £/kW/year versus current market price signals. What factors could drive such a recovery? There are structural drivers that are working in SSE’s favour to support a recovery in CCGT wholesale margins by early next decade. Lower variable cost coal and CCGT plants are retiring and being replaced by high variable cost engines, DSR & batteries. This is set to support peak prices, driving value into the top 20% of hours of the price duration curve. Keadby 2 will be the most efficient CCGT in the market when it’s commissioned. This will help it to run at high load factors (avoiding start costs) and to pick up margin rents when other more expensive CCGT units are setting prices. The plant is also likely to be highly flexible, supporting margin capture in the Balancing Mechanism. However, the plant also faces margin threats over its lifetime, likely to extend into the 2040s. These include the gradual erosion of load factors and margins due to penetration of renewables and the broader risks around a policy drive towards decarbonisation (e.g. possibility of emissions standards or higher carbon prices). Paying back a high proportion of capex in the first 5 years will be key to mitigating these risks. The 2018 auction clearing price cleaned out the majority of the UK’s remaining coal plant. It also presented an existential threat to a number of older and less flexible CCGTs. 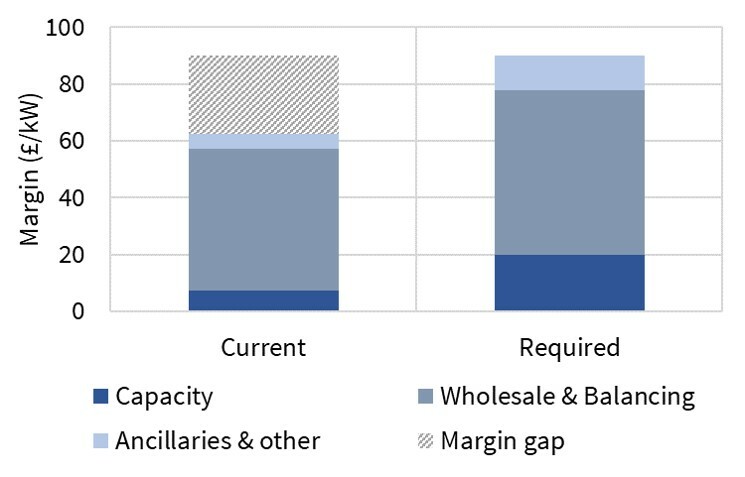 Further exit of thermal capacity and competitive value erosion headwinds facing engines and batteries are likely to drive a recovery in capacity prices towards 20 £/kW over the next 2-3 years. Ancillaries revenue is typically icing on the cake but there may be favourable factors in play for Keadby 2. From a TNUoS zoning perspective the plant may benefit from a transition to negative costs over the next few years, but there are more advantaged locations in Southern England. In summary, SSE (& any other equity partners) are bearing substantial market risk and are likely to need a structural recovery in margin for the project to be a success. But behind the headline margin drivers there are likely to be a number of other considerations that have a tangible impact on project economics. SSE have not announced details of their agreement with Siemens. But it is reasonable to assume that Siemens are providing substantial support (e.g. equity, efficiency /availability guarantees, favourable maintenance contract, risk sharing). Siemens and GE have been locked in a head to head battle for the last 5 years to try and deliver a bankable CCGT project that could be used as a template to support further turbine sales. Keadby 2 is not a greenfield project. There are likely to be important ‘end of life economics’ considerations associated with the existing CCGT plant on the Keadby site (commissioned in 1996). SSE will also be able to re-use some existing infrastructure, reducing costs. SSE may also attach value to the Keadby 2 project from a portfolio perspective. This is complicated by the proposed merger of the SSE and N-power retail operations. SSE is set to lose most of its flexible generation capacity over the next few years (given closure of Keadby & Peterhead CCGTs and Fiddlers Ferry coal units). Keadby 2 helps maintain a footprint in the UK thermal generation sector. Depending on the nature of the retail merger, SSE may also see a new CCGT providing protection from price shape exposure from its retail customer book. Time will tell if SSE (& Siemens) get paid for the risk they are taking in developing Keadby 2. But pulling the trigger first makes it even more difficult for other new CCGT projects to follow.